I'm just wondering if I'm better off with two, 6-volt batteries wired in series, rather than using just one 12-volt battery instead. I’ve heard a variety of reasons why and why not. What is your opinion? David, you’ll find this topic both cussed and discussed often! My take? Replacing 12-volt batteries with 6-volt batteries will usually increase the capacity to store amperage. I am a fan of using 6-volt, true deep cycle batteries for the house system when possible. It really boils down to simple math. 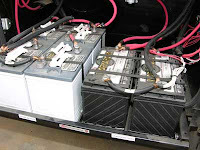 As an example; two Group 24 (12-volt) batteries connected in parallel yields approximately 170 combined amps of storage (about 85-amps each). Two Trojan 6-volt batteries wired in series yields about 225 amps at 12-volts. The more batteries you add, obviously the more current you’ll be able to store. Four 6-volt batteries wired into a series-parallel configuration, as another example, will provide about 450 amp-hours of use. Even if you had two, larger, Group 27 (12-volt) batteries in parallel, they only total about 210 amps, still less than two 6-volt golf cart batteries connected in series. 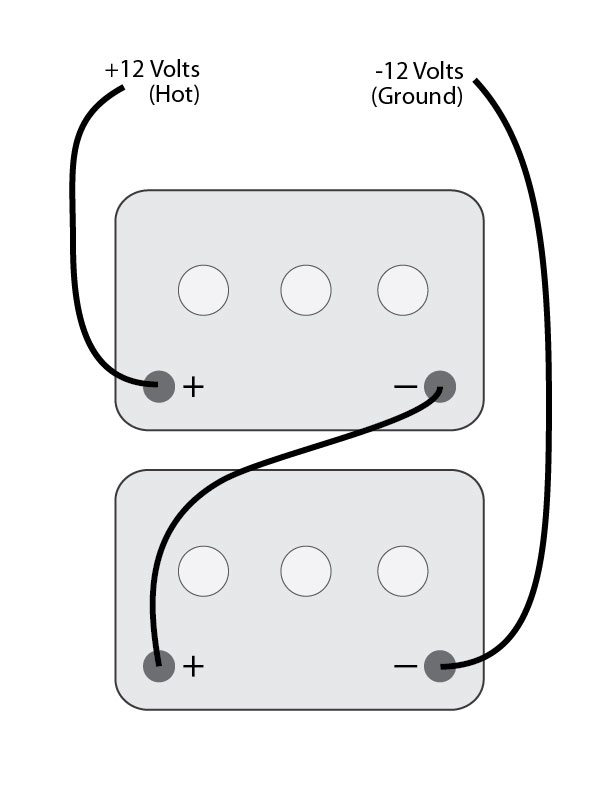 When connecting two 6-volt batteries in series, attach the hot lead (from the RV) to the positive post of one battery and the negative lead or ground connection to the negative post of the second battery. 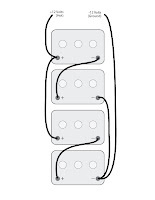 A short section of battery cable will connect between the negative post of the first 6-volt battery to the positive post of the other 6-volt battery, completing the 12-volt output configuration (see illustration at left). Realize that at the basic level, all DC components found in today’s production coaches are powered by 12-volts. If 6-volt batteries are employed, a minimum of two must be connected together in order to provide the 12-volt output needed. If you were to connect two, 12-volt batteries in series, the output voltage would measure 24-volts. 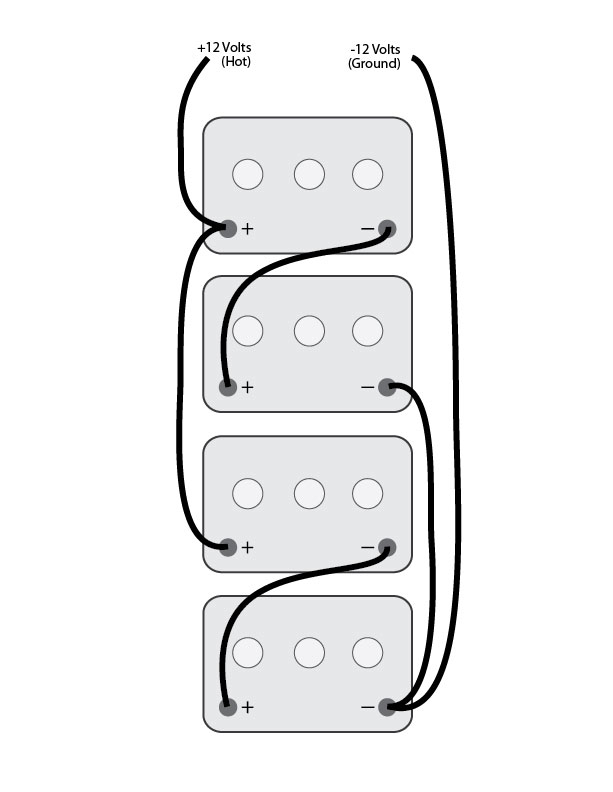 Likewise, two 6-volt batteries connected in parallel would yield a nominal 6-volts only. You can see the importance of knowing how your system is wired! In effect, what exists on the right are two “sets” of 6-volt batteries. 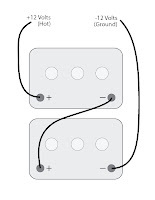 Each set contains two 6-volt batteries wired in series and then the two sets are connected together in parallel. And like their 12-volt cousins, for optimum performance, all batteries in any battery bank should be the same type, the same size and the same age. RV batteries are a substantial investment, so it makes perfect sense to be able to get the most out of that investment. And my motto has always been; carry as much battery capacity that you have room for and that your wallet can endure.